Make the most of unpacking with awesome cardboard box creations! Moving is a stressful process. This is especially true when you have children. The pressure of taking your children away from what they know can make the entire process a whole lot more difficult. Luckily, we’ve done a little research into some cardboard box creations that can not only make the process of unpacking more enjoyable, but also help your children warm up to their new home a lot more quickly. 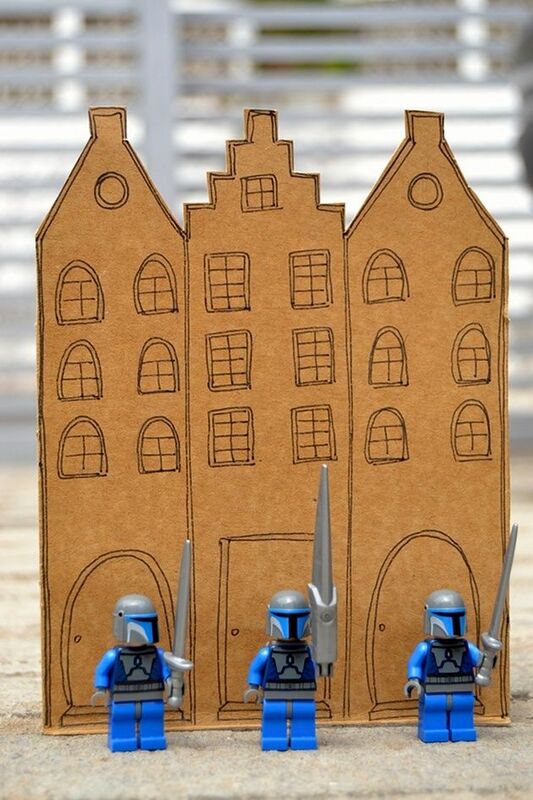 Check out some of our favourite cardboard box creations below. One thing you can be certain of having enough of after your move is cardboard boxes! Luckily, this means you have the right materials to set about creating a cardboard box castle for your kids. In the first stage, place your cardboard boxes on top of one another to let your kids dictate how big or broad the castle should be. Use a pen to write on the boxes so that you know what goes where. Once this is decided, you can use a utility knife (best not to let the kids get their hands on one of these unsupervised) to cut out the doors and windows of the castle. Remember, a vital component of any cardboard box castle is the drawbridge, which should be able to swing up and down. Once you’ve cut what needs to be cut, you can connect the boxes in the agreed upon design. Some people may prefer to use glue, but we think zip ties are just as effective. Simply thread them through pen holes you’ve poked into the boxes’ sides and it should keep them together without any additional sticky mess. Once the construction of your cardboard box castle is complete, let your kids sit for a while and draw the details directly onto the boxes or onto pieces of paper which can then be stuck into place. Make your drawbridge easy to move by threading some string through two holes at the top, so the kids can decide who is worthy of entering their cardboard kingdom! It’s not much of a secret that when it comes down to it, boys love Lego! Luckily, you can use this little obsession to your advantage when moving home with your kids by simply using a pen to draw a Lego-sized kingdom. If your kids are old enough, then you can challenge them to draw their own. Once the drawings are complete, you can cut them out and make them stand by sticking a cut off to the back in a perpendicular position. If your children have Lego from a specific theme, such as a Medieval time period, then they can create an entire village of cardboard buildings in which to play for hours on end. 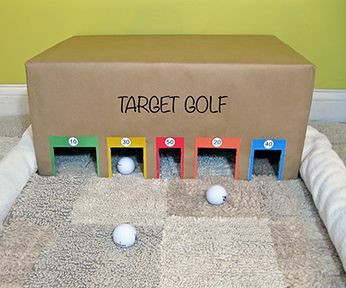 Use cardboard boxes to craft a game that’ll keep your kids occupied for hours. Make each target hole a different size, colour and value, and then mark a place for the children to stand a couple of metres away. Task your children with the goal of getting the ball into the targets that will give them the most points. Naturally, the greater the amount of points on offer, the more difficult the target ought to be to get the ball into. After ten tries, the winner with the most amount of points gets a prize and the game can start again. Not only does this game get the kids focusing their energies onto something that won’t interfere with your unpacking, but it could also encourage the inner golfer in each of them to come out and shine! If you’re moving home at a particular time (i.e. Christmas), then use the multitude of cardboard boxes you have available to you to the benefit of your family. Restore the festivity of Christmas to your new home with a cardboard box Christmas tree complete with paper and cardboard decorations that have been made by your children. To make the tree, draw the basic shape twice on two separate pieces of sturdy cardboard. In the one cut a slit from the top of the tree, and in the other cut a slit from the bottom of the tree. Then slide the pieces together and you will have a simple tree that stands by itself. Once your tree is up and standing, gather the kids and get them drawing. Cut round circles from leftover cardboard and string buttons together to make a colourful array of cardboard Christmas tree decorations. Not only will this festive project keep your kids busy, but it’ll also ensure your family can celebrate the joy of Christmas without the downer of broken Christmas decorations that need to be found among a multitude of boxes before the fun can even begin.